Or look on fb for Shaun Sanders adjunct Santa Barbara. Mike is a great guy and makes great suggestions. I used 304 SS and he charged me a mere $325, including spare pin. He followed the plans posted on this blog somewhere (wish I could find them again), although we did make some adjustments, so check your old brackets against the drawing before ordering. I'm also happy to answer any questions. My new brackets needed additional correction: I countersunk the bolt holes and use flathead ss screws instead of bolts; I also had to grind off the top edge of the new brackets (where they fit against the hull at the top of the housing) to make the bolt holes line up with the hull bolt holes, and to make the fit snug--but talk to Mike about that as well. To get the boat off the trailer, I used 50 gal steel drums, with blocks of wood under the stern and three 2"x8"x10' planks bolted together as a beam to support the bow (probably over engineered). 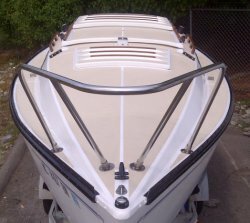 I did the old trick of dropping the trailer tongue, sliding the drums under the stern, raising the tongue, then sliding the beam under the bow, also on drums. Then pulled the trailer out from under. Finally, I used coal tar epoxy on the keel, Rustoleum. I would not recommend it, though. I ground off old paint and rust with a grinder, then wiped down with acetone. I then immediately coated (after the acetone dried) in coal tar epoxy. I gave it two coats, taking the recommended time between coats. Unfortunately, it is not easy to get an 800lb keel back in a 3-4 inch slot, and the keel inevitably scrapes against the new brackets and the keel slot when going in. To my horror, when the keel scuffed, the coal tar epoxy rubbed off in rubbery lumps, leaving bare metal, and this was two weeks after it had been applied. I was greatly disappointed by this unexpected result. Apparently, it doesn't set hard, like a normal epoxy would. If I did the job again, I'd use a regular paint type rust primer, not coal tar. Nice work, thanks for sharing ! hey, what's the guitar in the profile pic ? That doesn't sound right for coal tar epoxy. It does have some stretch (elongation as the manufacturer calls it) which makes it superior to other epoxies for durability. Rustoleum strongly recommends, per their application page, that when applying two coats, each coat (thinned with Xylene) and applied at 8-10 mils with air equipment. How did you apply the epoxy? Did you use the 4:1 ratio for the activator component? I can imagine how frustrated you were after all that work. I'm going with the same coal tar epoxy product and will post my results. Your post definitely gives me some ideas of how to proceed. Mainly, that I'll be doing a test on some scrap steel and let stand for week or so. Re the guitar, I study flamenco guitar, and that one was handmade by a local luthier in Santa Barbara--Bruce Wood. It's an ok guitar, but not as nice as the one I have now, which was made in Granada, Spain. As for the CT epoxy, my ratios were correct. I applied it with a brush. I didn't thin it at all--I didn't see anything in the directions that suggested I should, but perhaps I didn't read the teeny tiny print on the can closely enough. Good luck with CT application. Dang, the post is on face book and I can not access from work. Hope I remember tonight! LOL! another catgut guitar in our mists! LOL! We may have to convert you! CaptainScott wrote: Better look out EE! What did the pin cost you? Did your brackets need to be replaced? Hi I'm Scott + am a Newbie to the Forum.